Is your child interested in hunting for hidden treasure? If so, choosing a detector that’s fun to use without spending a fortune can be difficult. Here are some of the best metal detectors for kids categorized by age range. Metal detecting is a wonderful hobby for children. It’s educational, encourages curiosity, and gets kids to spend more time outside. The hobby is also a great way for adults and children to spend time together while learning about local history. Choosing a child’s metal detector isn’t easy though – especially if you’re not a detectorist. There are endless options on the market, but most are only toys. Your child is unlikely to find trash with these models, let alone hidden treasure. On the other hand, many “real” detectors you see recommended are expensive and may not be suitable for children. Despite these difficulties, buying a child's detector isn't a decision that should be taken lightly. The right choice could encourage a lifetime passion. The wrong choice may kill any enthusiasm before it develops into a lasting hobby. The last point might sound obvious – but it’s the difference between a toy detector and one that’s of professional quality. To be clear, nearly all the detectors sold under $100 are toys (with a couple of exceptions). They might pick up a coin just below the surface, but are frustrating to use and miss most targets. If you want your child to have a chance of any real finds, avoid toy models at all costs. That doesn’t mean you need to spend $1000 just to get a detector that works though. There are many cheaper options that still provide excellent quality – albeit with fewer features than premium machines. These detectors are capable of finding relics, jewelry, coins and even gold. To help you make the right choice, here’s a list of six of the best kids metal detectors. Each of these models are entry-level and reasonably priced, yet provide professional-standard detecting to allow your child to get started with a brilliant hobby. What Can a Child Expect to Find with These Models? How Quickly Will These Models be Outgrown? Will They Work at the Beach or in Fresh Water? The metal detectors listed below provide great quality for a reasonable price. While I’ve categorized them according to age range, make sure you read the reviews carefully to find the right option for your child. There are surprisingly few options for budding young detectorists. While there are plenty of toys that claim to be metal detectors, most are of poor quality and likely to dampen your child’s enthusiasm rather than support it. Fortunately, Bounty Hunter has come to the rescue with their Junior T.I.D. model. As it’s available for such a reasonable price, there’s no reason to choose a toy model over the Bounty Hunter. If you’re looking for a fun kid’s metal detector with many of the features found on adult machines, the Bounty Hunter Junior T.I.D. is a great choice. It has a number of useful features, such as target identification and discrimination, but with a cute package that’s designed to appeal to younger children. Ferrous (Sad Face) – When the Junior T.I.D. detects an iron target, including bolts and screws, it displays the sad face. There’s also a low audio tone. Non-Ferrous Low Conductor (Question Mark) – If the detector finds a target in this category, a question mark icon is displayed along with a medium-pitch tone. This is because the object could be rings or other jewelry, but may also be trash such as bottle caps or pull tabs. Non-Ferrous High Conductor (Smiley Face) – Silver coins, copper coins and silver jewelry trigger a smiley face emoji and high-pitch audio tone. With a weight of just 1.5 pounds and minimum length of 19”, the T.I.D. is a lightweight machine that’s comfortable for children to use. It’s never going to detect the deepest items, but is capable of finding coins to a depth of up to 5-inches. On a technical level, the Junior T.I.D. is a VLF detector with a 6.6Khz frequency and pre-set ground balance. It has discrimination control, allowing your child to filter unwanted targets, and a 6” concentric search coil. There’s even a visual depth indicator – although the lack of headphones means it can be difficult to hear the audio tones when in noisy locations. Overall, the Junior T.I.D. is a brilliant choice for aspiring young detectorists. It’s lightweight and easy to use, yet has many of the features found on more advanced detectors. The T.I.D. is also surprisingly effective – especially compared to “toy” models. While the Bounty Hunter Junior T.I.D. is great for younger children, older kids will quickly outgrow its capabilities. It also hides settings and features every detectorist needs to know how to use, such as sensitivity. That’s why I recommend paying extra to get an entry-level adult model for children over the age of 8. The models listed below all provide high-quality detection features, so there is plenty of scope for your child to improve their skills without getting frustrated. They are also lightweight, straightforward to use and don’t cost a fortune. The Bounty Hunter Tracker IV is a relatively cheap detector that’s designed for beginners. It’s not as kid-friendly as the Junior T.I.D. – mainly due to its analogue control panel rather than digital display – but has more features. It’s also user-friendly and easy to use, so it’s a great choice as a child’s first detector. Let’s start with the control panel. With just two knobs for sensitivity and discrimination, along with a numerical display for signal strength, it’s very simple to get started. The detector lacks features found on more expensive models, but this has the advantage of making it easy to learn. Despite its simplicity, the IV still provides more scope for improvement than the Junior T.I.D. The sensitivity control, for example, allows the user to learn how to balance false signals with increased depth. The simple discrimination knob makes it easy to ignore unwanted targets, such as lead and iron. There are also several operating modes. The “All Metal” option detects all targets while ignoring the discrimination setting, so it’s a great choice when you’re just getting started. The discriminate mode allows you to filter based on signal. A bonus is the Tracker IV has an automatic ground balance function. When hunting on ground with high mineralization, the detector adjusts the ground balance to avoid losing sensitivity. There are a few downsides to the Tracker IV though. The lack of a target indicator on the control panel makes detecting less visual than other models. While the analog meter shows signal strength, which can indicate depth and size, it’s much less accurate than the target identification found on more expensive models. It’s also heavier than some of the other models on this list. The 4.2lbs weight isn’t too heavy for older children, and it shrinks to a relatively short length, but make sure you child is able to hold it for long periods before you buy. Even so, if you want an inexpensive detector that’s easy to use, yet provides a reasonable amount of control, the Tracker IV could be a great choice. The sensitivity and discrimination settings also teach the core concepts of coin or relic hunting without being overcomplicated. Interested in learning more about this model? Check out my Bounty Hunter Tracker IV review. 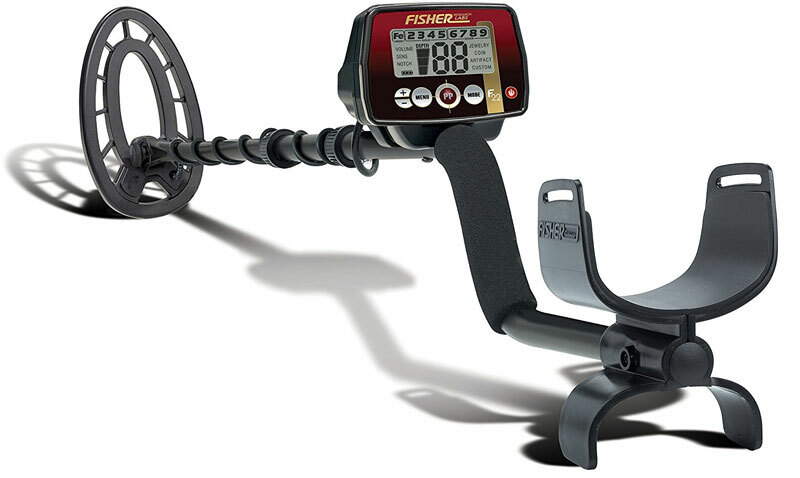 The Fisher F22 is my #1 pick for an entry-level metal detector (see here for the full list). It’s lightweight, easy to use and provides a variety of settings you would expect from a more expensive model. These features also make it an excellent choice for an older child’s first detector! At its core, the Fisher F22 is a VLF detector with 10 sensitivity levels and several preset hunting modes. These include coin, artefact and jewelry modes, which are great for children who want to get started quickly. There’s also a custom mode as your child gains more experience and knowledge. One of the best features of the F22 is its lightweight design. Weighing just 2.3lbs, it’s considerably lighter than the Tracker IV, yet has a larger 9-inch search coil to provide greater depth. Unlike the Tracker IV, the Fisher F22 has a proper digital screen. This displays details such as a 2-digit target ID (showing what type of metal has been found), iron identifier icon, and a depth indicator, along with the detector’s current settings. While a digital screen isn’t essential for detecting, I think it’s more enjoyable for children to get visual information when hunting. There’s also four-tone audio target ID, which is great for learning how to identify based on audio signals. The F22 is more expensive than the Tracker IV, but it’s a higher quality model that your child won’t outgrow in a hurry. With fast reactivity, sensitivity adjustment, a notch discrimination system, and a pinpointing mode, it provides plenty of control – yet a beginner can opt for the preset modes if they feel overwhelmed. The downside of the more extensive control panel is that it’s not as simple to use as the Tracker IV. It’s still easy to learn, although for younger children a simpler model might be a better choice. Additionally, while the lack of manual ground balance is a downside for more experienced detectorists, it’s one less setting for a beginner to worry about. In summary, the F22 is a brilliant metal detector for both children and adults alike. It’s also reasonably cheap considering the range of features and excellent performance. 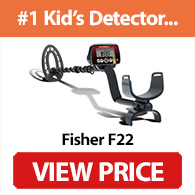 If you want a professional-standard model that provides plenty of scope for growth, the F22 is my top pick for the best children’s metal detector. 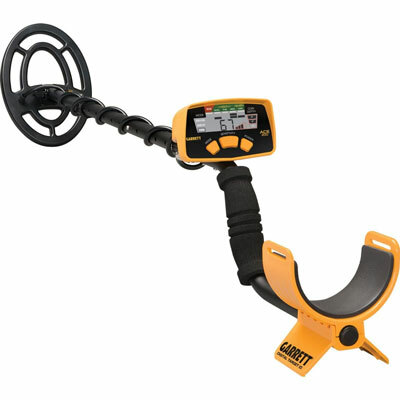 Another excellent metal detector for kids is the Garrett ACE 200. While it’s a straightforward model that’s easy to use, it has all the features your child needs to start hunting for hidden treasure. With an operating frequency of 6.5kHz and a 6.5” x 9” concentric searchcoil, the ACE 200 is great for hunting coins and does a decent job at finding relics. The coil is fully waterproof, so you can use it in shallow water (although the control box can't get wet), and it’s lightweight at just 2.75lbs. While the ACE 200 isn't as feature-packed as the F22, it’s a cheaper detector and still has three search modes, 4 sensitivity options, pulse-width modulation, and a depth indicator. There’s also a digital target ID (0-99) via the display and a handy low-battery indicator. In other words, it provides an excellent introduction to the main features of a metal detector, without being confusing. In fact, one of the best things about the ACE 200 is how easy it is to use. There’s a short learning curve, as most of the settings are limited to a few choices, and the target ID is great for learning how the detector responds to different types of metal. Something to note is that the 200 doesn’t come with a pinpointer function. For this feature, you’ll need to pay extra to get one of the more expensive ACE models. Even so, the Garrett ACE 200 is one of the best child’s metal detectors from a top US brand. It’s also cheaper than the F22 – although it doesn’t provide the same amount of control over sensitivity and discrimination. The Tesoro Compadre is a professional-standard metal detector that’s often used as a backup by professional detectorists. It provides excellent performance, yet is simple to use and relatively cheap. If your child won’t mind the lack of a digital display, the Tesoro is an excellent choice. With a 12kHz frequency and 8” concentric search coil (there’s also a lighter 5.75” coil model), the Compadre can search reasonably deep for such an inexpensive machine. In fact, it has many of the features you would expect from a more expensive model, despite its simple design. Some examples include a discrimination setting, two search modes and built-in mineral rejection. It’s also one of the lightest metal detectors on the market, at just 2.2 pounds. There’s no manual ground balance, although this is to be expected from a budget detector. A bonus is that the Compadre is built to withstand heavy usage. If your child may not always treat their detector gently, the Compadre could be a great choice. The biggest downside to this model is that it doesn’t have a digital control panel. This may put some children off, as the lack of visual depth indicators or target IDs can initially make hunting more confusing. It also may take some time for a child to understand the various sounds it makes. On the flip side, the single knob control is probably the easiest to use of any detector. If you want an affordable metal detector that provides great performance, the Compadre is one to consider. Note: If you’re struggling to decide whether to buy the 5.75” or 8” coil model, the biggest difference is sensitivity to smaller objects. A smaller coil provides greater sensitivity and less interference when hunting near fences or other metal equipment. A larger coil provides greater depth, at the expense of small object sensitivity. A bigger coil is also heavier, which is something to keep in mind for young children. 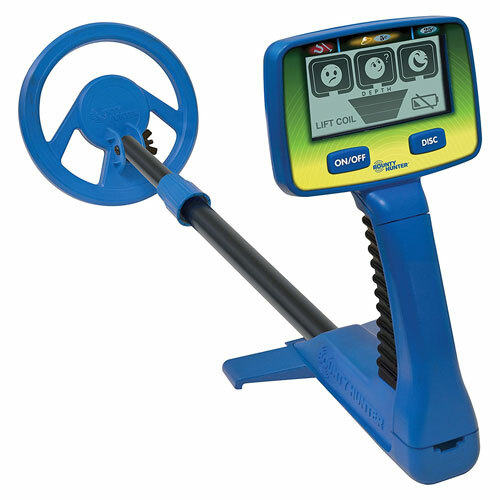 While the other models in this section are entry-level detectors for all ages, the Teknetics Digitek is specifically aimed at teenagers and “tweens.” It still has many of the features you would expect from more expensive models, yet is available for an affordable price and has a lightweight design. Like all the models on this list, the Digitek is a VLF detector. It has a 7.69kHz operating frequency, which makes it great for coins and relics, but less suitable for gold. There are also a range of features, including adjustable sensitivity, notch, and adjustable discrimination settings. These features, combined with the 9 Target-ID categories, 0-99 target ID numbers, depth indicator, and 7” concentric coil, mean your child won’t outgrow the Digitek for a long time. The model also has an easily-adjustable shaft, which is important as your child gets taller. As you would expect from a detector in this price range, the Digitek doesn’t have a manual ground balance setting. This makes it unsuitable for detecting on wet saltwater sand, but for most environments it does a good job. It’s also capable of detecting a coin down to an impressive 8” in the right conditions. Overall, the Digitek is a great choice for teenagers. While the Fisher F22 is the superior detector, if you’re on a tight budget the Digitek has many of the same features, along with a stylish control panel. The metal detectors on this list are all suitable for children (depending on age), but they still provide high-quality detection performance. This means they can theoretically detect anything that’s metal, including jewelry, gold, relics, coins - and trash! Of course, which items are detected depends on many factors. The location plays a role, along with the soil mineralization, depth and detector settings. All the models on this list provide the chance of finding potentially valuable items though. It's also important that your child learns how to use the detector properly. Reading through the manual while testing the detector is a good place to start, but you may also want to watch instructional YouTube videos with your child before heading out to a real hunting ground. No, the models on this list are all professional-standard detectors that happen to be suitable for children. While they lack the advanced features and settings found on more expensive models, they are capable of “real” metal detecting. The only exception is the Bounty Hunter Junior T.I.D. While this is much higher quality than toy detectors, it’s specifically designed as a metal detector for kids. As a general rule, I recommend avoiding models such as the Discovery Kids metal detector or those you see in Walmart. Stick with the models on this list (most of which are available at Amazon) and you can't go far wrong. On a side note, different stores may sell a detector with a variety of accessories. While the base detector is always the same, make sure you check what the kit includes. This depends on the model, your child’s enthusiasm and age. Most metal detectors have an adjustable shaft, so you can adjust the size as your child grows. This also makes a metal detector suitable for siblings of various ages. Aside from the physical size, children are unlikely to outgrow the features of an entry-level detector in the near future. The best kid’s metal detectors provide plenty of features and settings, so there is lots of scope for learning and improvement. Technically, all metal detectors can find gold. The problem is that VLF detectors aren’t very good at handling the highly mineralized ground where gold is usually found. While the models on this list can find gold nuggets or jewelry, they are not great choices if your child wants to focus on gold prospecting. 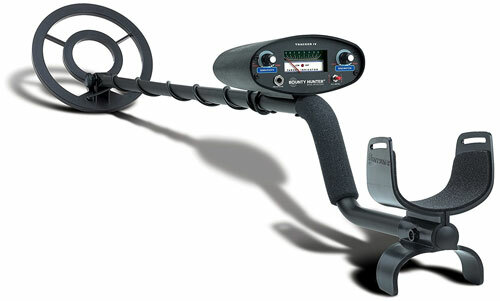 For this, take a look at our list of the best gold metal detectors. One of the most popular locations for metal hunting is the beach. But can entry-level detectors handle sand and saltwater? The answer is that it depends on where you hunt. None of the models on this list have a manual ground balance setting or a “beach” mode. While they can be used at the beach, you should expect plenty of chatter when hunting on salt-water saturated sand. They should work fine on dry sand though. So, they are still suitable for beach hunting if you stay way form wet sand. All the models have a waterproof search coil, so they can be used in shallow fresh water. The problem is that they don’t have waterproof control boxes, so if your child slips or even splashes water accidentally it could damage the electronics. For this reason, the models are best used in dry locations rather than underwater. Metal detecting is a brilliant hobby for children - but it can be difficult to know which detector to choose. It’s important to get a “real” detector that nurtures your child’s enthusiasm. 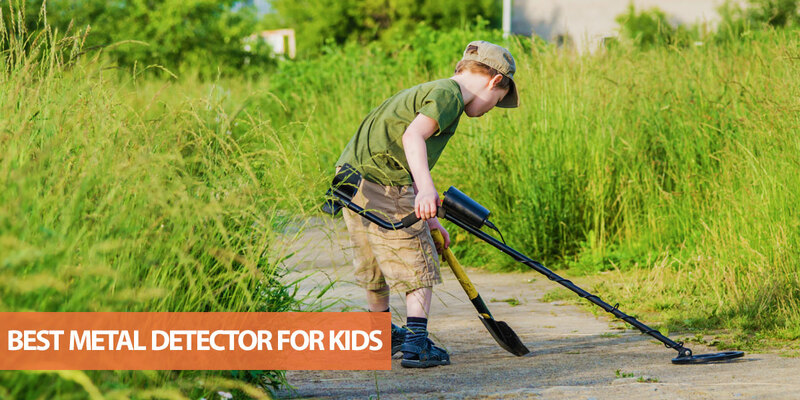 While a toy metal detector for kids might be a lot cheaper, your child probably won’t find anything with it, which quickly becomes frustrating. The good news is that you don’t need to spend thousands of dollars on a high-end detector – especially as you don’t know whether your child will enjoy the hobby in the long-term. Instead, the models on this list provide excellent performance without breaking the bank. Your child may also want check out our beginner's guide and tips page for help getting started. If you just want to know my top recommendation, it's the Fisher F22. While it's a little bit more expensive than the other models, it's a professional-standard detector that your child won't outgrow. Do you have any questions about choosing the best metal detector for kids? Or do you have tips for parents or relatives who want to take their child detecting? Let me know in the comments!